ReviewLink 3.5 has built-in mobile testing features! 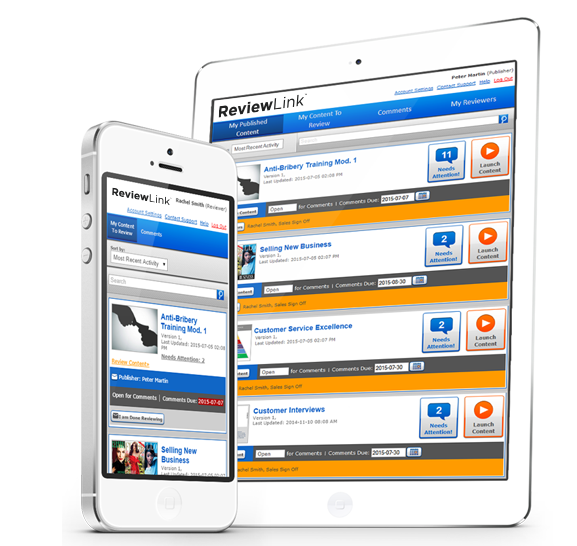 your reviewers to quickly and easily test responsive content in different device views. The current view displayed when comments are submitted are then saved with that comment, so publishers can easily sort and filter by device view. ReviewLink includes the ability to mark up courses. With ReviewLink you can draw lines, arrows, ellipses, and highlights directly on the page to add visual enhancements to your course commenting. Need to get course feedback and signoff from colleagues? ReviewLink is an online, responsive review tool that lets eLearning developers host published courses and manage feedback—all in one place. Still not sure? Try it for free. Publish eLearning content directly from Lectora and Lectora Online to ReviewLink, or upload content from Adobe Captivate® or Articulate Storyline®. Then, send email invitations to your team members, manager, or subject matter experts to review your course. Share courses with unlimited reviewers – Reviewers are free and simply log in through a web browser to leave feedback. Collect feedback through comments – Use Comments to add feedback and attach files to individual pages. Each comment has a status to track its progress. Select from a list of predefined statuses or add your own custom status. Manage feedback – Filter, sort, and search a list of all comments, or Export comments to a PDF or CSV file to work offline. Manage reviewers – Import users and manage reviewers with groups. Stay informed – Track Activity through Email Notifications. Work globally – ReviewLink is available in 7 languages.